Incisive, thoughtful, imaginative, visionary. An artist provides a window that inspires and enriches the experience of the many elements that make up culture: our histories, geography, departures and arrivals, our families. In this interview, Menominee, Michigan native and artist Derusha relates travel, indigenous life, and family heritage to her photography depicting roads, byways of culture and society. —ed. Q: The name Derusha is familiar to many people who research genealogy or read about local history in the Great Lakes region, especially the Straits area. It’s a lineage many French-Canadians, Métis, and Native Americans share. Does this heritage impact your work? Do the journeys of your ancestors inspire you? A: I just started learning more about my heritage in the past three years. Seeing photos, learning about my culture and hearing stories from relatives for the first time, feels like a gift of blood, rejuvenating me, and helping me connect to my lineage and land. I think there is a parallel of traveling roads and trade of artifacts and painting that is similar to my forebears. Sometimes I’m totally speechless and in tears listening to stories about my relatives, their hardships, their sense of humor, their love of the land, their determination against the harsh weather, their building skills, fishing and hunting. I can’t help but feel blessed and realize how long I have lived and traveled to come to understand my own cultural heritage. I saw a photo when I was a young girl at my grandfather Harold’s home of my great great aunt Mary Jane Derusha Goudreau (known as Jane Goudreau) who lived in St. Ignace. She had a pipe hanging from her mouth which I thought was strange — I thought she was a man. I heard stories about her from my grandfather. She collected Native American art and was married to a boat captain. He said Jane attended a banquet for the opening of the Mackinac bridge, November 1, 1957 where she a denounced the priest in public for saying they could eat meat at the banquet which was held on a Friday, then a day of absence of meat in the Catholic church. I was also told that she wouldn’t smoke her pipe in front of my grandmother who she thought was a proper lady. When we would travel by car as young children my father would tell us to look for Indians, to keep us quiet and occupied. He would often say he’d see them hiding in the trees watching us, waving to us, my imagination stirred and sharpened my eyes. Every year as a family we would sail to Beaver Island to buy smoked fish from a local family and eat it on the beach. My father would tell us the story of our grandfather being born on a small island called Hog Island, how poor they were and how vital it was to be a good fisherman. As he would tell the story he would slowly debone the fish, first pulling off the head and saying how much he loved to eat the eyes that he said tasted so good it was like eating candy. I didn’t understand at the time that I might be related to the family that sold us the fish. It was the one symbolic ritual our family did to honor our native past. Growing up on the water and watching the weather I recall the days when I could not see the horizon, no difference between the sky and the bay. It inspired me to think of endless possibilities. What inspires me in my art of taking photos of roads are the endless possibilities and having patience to discover with confidence that I will find something, something else other than just the road. Q: You have spent time in Australia and your work has been exhibited there. You met people involved with the Western Desert Art Movement, which put Australian Aboriginal art on the map. 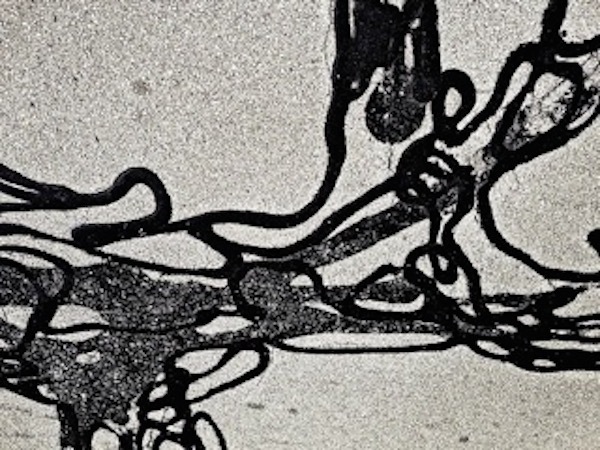 Aboriginal artists often depict ‘songlines’ or ‘footprints of the ancestors’ in their work. These are geo-spiritual and cultural maps held in the lore and imagination of their peoples. Is there a connection for you between this subject in Aboriginal art and your photography on roads? A: Before I even met an aboriginal artist or really knew aboriginal art, I heard that their viewpoint was from above, looking down at the ground. It captured my imagination as I was driving for the first time across Australia from Sydney to Alice Springs. I started looking at the roads from an aerial perspective view, like an aboriginal artist might, and drew sketches of the roads. These sketches would later be developed into paintings of the roads I traveled and I exhibited a series called roads at Watch This Space in Alice Springs in 1994. Aboriginal art is based on the spirit of the land. In many ways I think the roads I discover have spiritual stories. I think I’ve always had a connection to the land, but when I met aboriginal people they led me to a desert that looked wide open like Lake Michigan and I think I understood the skill it might take in order to survive. Understanding the hardships of their survival in the vast desert made me think of those who survived the harsh conditions of the Upper Peninsula of Michigan. My grandfather always told me that people who grew up in the harsh cold weather were strong, determined, hard-working people who might appear to be quiet or cold, but he said under their shell were deep warm hearts. I felt when I met these aboriginal people I understood their hearts. Many of the men I met were painters that started the Western Desert Art movement. These men knew how to hunt for survival, they were lawmen that gathered to guide their tribes/families, they built roads, and they herded cattle, built shelter, and fixed cars before becoming well-known painters. My mother went to school to be an art teacher; I grew up as her student. When I went to the outback and met renowned artists and spent many years with them, I felt connected to my mother as an artist and my father who was a business leader. But there was another thing I became conscious of from spending a great deal of time with aboriginal people: that I must never forget where I come from, otherwise I’d be lost. Being aware of that we grew mutual respect for one other. Family has always impacted my work, I travel all the time to visit them. 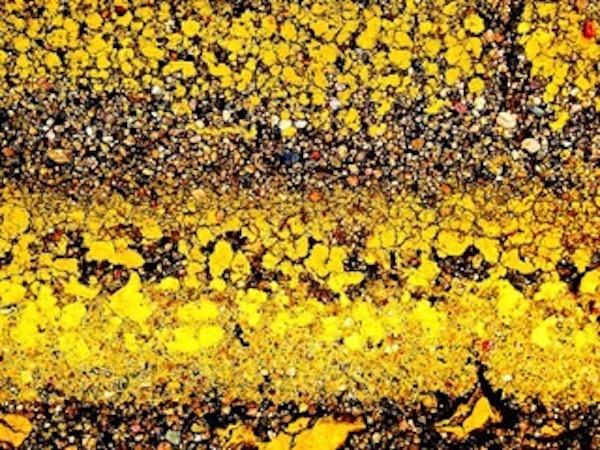 Q: Some viewers of your “Roads” series might see just paint and tarmac. Or they might reflect on the texture in the images that evolve with close scrutiny. There are many components in the photographs: paint, rock, earth, and tar, layered by human hands. Through your photography, the road becomes something new. In images like “OK” I see design happening – the work of the road in progress. You describe the symbols in this series as a kind of primitive, almost tribal communication. In “Fly” the tar-work looks like it could be a work of art itself. 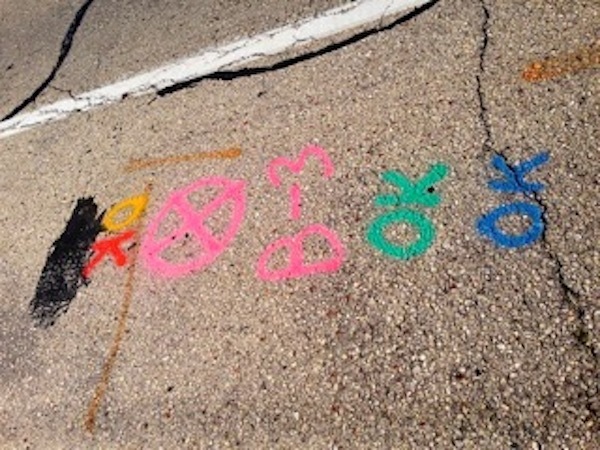 What do you think a road construction worker might see in your work? Is the road itself a work of art? A: A road construction worker would understand the coded language immediately, just as an aboriginal artist would likely understand symbols in another aboriginal artist’s work. I think they would see that I love roads and I’m aware of the work they do. They might be surprised about the things I see in roads and might understand that I appreciate their labor. Making art of these existing roads is a combination of road construction, wear and tear, weather conditions, and my ability to extract information into a time and space. I have seen roads repaired by construction workers who are artists or artistic. I imagine it would be very tempting to go beyond just the mundane repairing of so many cracks to adding a gesture or form that breaks the monotony. I photographed a road that had hundreds of drawings mixed with road repair. I once noticed when I was driving down a road for the first time with my relatives I saw familiar images like a crocodile or a rabbit painted using the road tar, and once I pointed them out, they were astonished that they had not noticed them in the 20 years that they had driven on that road. I spent days photographing that road as I had never seen anything like it. But afterwards while I was editing the photos and thinking about the idea of photographing someone’s artwork, I wondered is this my art, or is this the road construction workers art? Then I wondered if I shared these works it might get the road construction person in trouble. Roads are amazing and yes I believe the construction of a road is beautiful, especially when it works well and leads one to where they need to go. As for the road as a work of art, perhaps as a canvas, yes, or a sculpture, yes, or a language, yes. For me the art of the road is a combination of my aboriginal art history, travels visiting family, road workers, and those who have traveled before me, through all types of weather. Q: Another component to some of your images is that of life. Your image of a plant growing up through cracks on a road evokes a sense of reclaiming, of healing. 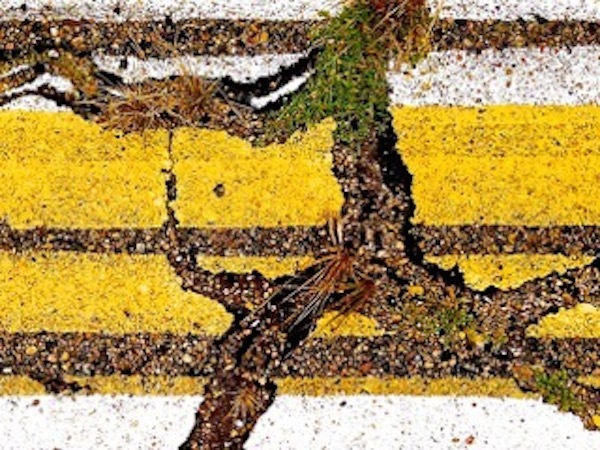 A small crack in the road allows nature to overtake human design. In “Trawl” the scaly textures could be marine life. What is the connection between the road and life? Is the road a sort of living entity? A: Roads are universal; we are constantly building or repairing roads to serve as an easy passage for our travels, our journeys. Some roads that are no longer functional are left to decay while new roads are built along side or rerouted for more efficient travel. I look at the philosophical aspect of a road as a body, a living organism that flows like blood, small arteries branching out like roads. The earth supports the body till death and time overcomes it like life. Or I can look at a road as a symbol of all the roads in my lifetime, something in it sparks a memory of an experience I had somewhere else on another road in my life. Trawl is a taken in Nebraska. On the side of the highway on US 281 was a federal project that tested road construction materials for roads. It was like making a discovery; there was so much action within 25 ft. of that tested road out in the middle of nowhere. I was surprised to see so many lines painted on the bitumen, cracks breaking through and grass coming up, it looked like it had been through an earthquake, but it is just life taking over the unused surface. When I began to look through the lens and editing the photographs, I could see figurative and organic images. I am amazed by how a road can look like so many other places, things, and people. Q: US 2, which crosses Michigan’s Upper Peninsula, evolved over centuries from trails first developed by Native Americans. It might even be the case that these Native American trails arose from trails forged by the animals they hunted for sustenance. Do you consider this sort of natural history when you photograph a new road? A: When I see a road that suddenly takes me into moment rather than the destination, I’m not thinking about its history. Highway US2 is a road I traveled since a young girl, I never went searching to photograph that road because of my heritage, it just happened to capture my imagination when I went to my first Powwow at the Straits, three years ago. I traveled up there to attend Heritage week and to meet relatives I had never met who I had become acquainted with through Facebook. When I traveled from my hometown Menominee, Michigan and began to enter St. Ignace, I began to see the road repair of wild lines of tar reaching across the highway US2. It excited me and drew me back into the time I traveled across Australia looking at roads. I think I knew at that moment that my art medium was about to shift and go on the road. It was US 2 into St. Ignace that changed my art; I decided my main focus was going to be roads again. It was the exact time I found out I belonged to the Mackinac Chippewa and Ottawa tribe and birth certificates proved it. I decided to take all my history, my 14 years painting in Australia, and my travels in America in my car and bring them together in a way which magnifies my nomadic existence. Q: What does it mean for you to go on the road, to travel from Menominee to St. Ignace, from Santa Fe to Alice Springs? Are you looking for new subject matter when traveling? A: I get excited when I get in my car, get on a bike or walk along a road; it’s like entering an art studio with all the supplies. When I travel in my car I feel like something great is going to happen, like something unique is going to reveal itself on the road. Weather can get me outside to look at roads; traveling from A to B gets me looking at roads, no matter where I go I look roads. Time is always critical, do I turn around, and can I stop? Is it safe? Many times if I am with someone or have plans to get from A to B, I cannot stop and photograph, so I’m planning in the back of my mind when I can go back to that place to investigate more. My grandmother Evelyn who was married to my grandfather Harold Derusha had a sister named Lucile. Lucile traveled the world mostly by freighter boats. In the 1970’s she went to Alice Springs and bartended for a year. She bought many watercolors from the artists. In my 20’s I visited her in Long Beach, California and saw the paintings she had collected. When I arrived in Alice Springs the first time many years later, I met up with an old friend of hers that she bar-tended with at a place now called Uncles. Later when I had an exhibition of my road paintings in 1994 at Watch This Space, I was walking along the Todd River, I was approached by a man who called himself Johnny and he told me stories about aboriginal people and sang a water song for me while putting a blade of grass through his nose. I had no idea that I had just met one of the founders of the Western Desert Art Movement – Johnny Warangkula. He began to hang out at the gallery I was exhibiting in. He taught me language and told me many stories about his life. He said he was the richest man on earth, that his country held the most gold, and that his family was most important to him and that his country was my country too. Going on the road is mostly a destination to see family or friends, but on the journey I meet new friends and see new roads. I think all my life experiences reveals itself in a road. My sincere thanks to Derusha for taking part in this interview, with generous and insightful answers to my questions. For more information or to make inquiries, see her website Derusha: Abstract Art of Man and Nature on the Road. All images in this interview by the artist Derusha are copyright Mary Derusha; other images are in the public domain.